What is Zin for those old VTVMs I always wondered (I know it is high, but how high). It just depends on the input voltage divider. Tubes in general do not have a higher input impedance than FETs. The claim to fame for a VTVM is that it does not have the low input impedance of say a 20,000 ohm/volt analog meter. the RV55 have a 1M 20pF Input, so it likes Probes from Scopes. My most beloved meter atm. straight from the 70..80's Poland. Have only BNC connection and one banana for grounding. I have two units, another one is in better physical shape, but this one is "spot on" through voltage scales. As this have 100 Megs input in all DC ranges it is actually a picoammeter also (while nA is as low I have gone so far). What I have found really nice for my odd hobby metering is the center zero selection, which splits the sensitivity range to half (negative and positive). I wish I had the original "Radio Frequenzy Probe" since the HF button allows measurements up to 1000MHz with it (1.5 - 15V + 250DC max). Anyway big claims on the "The only meter a laboratory need." isn't too far, really versatile meter and I suppose it is one of the best of the FET analogs there is (outside the big boxy benchmeters / metrology stuff). Also exported under Marconi and Conway brands. Uses hybrid amplifier. ESD clouds around a room are real!! Here's some pics of my trusty Fluke 75 while it was open for a battery change. A long time ago it was connected across a 12V SLA battery with the probes in the 10A current sockets. 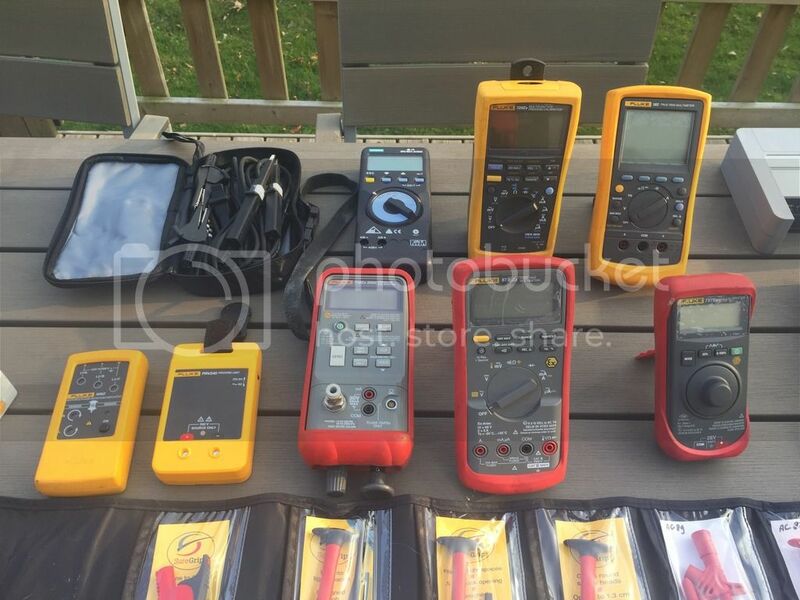 I recently took a photo of my actual Fluke multimeters family. The Fluke 83, still a recovery project, since it needs the LCD screen replaced because it's broken, and some contacts to one of the elastomer can't be done. But so far, I couldn't find a replacement at a decent price. 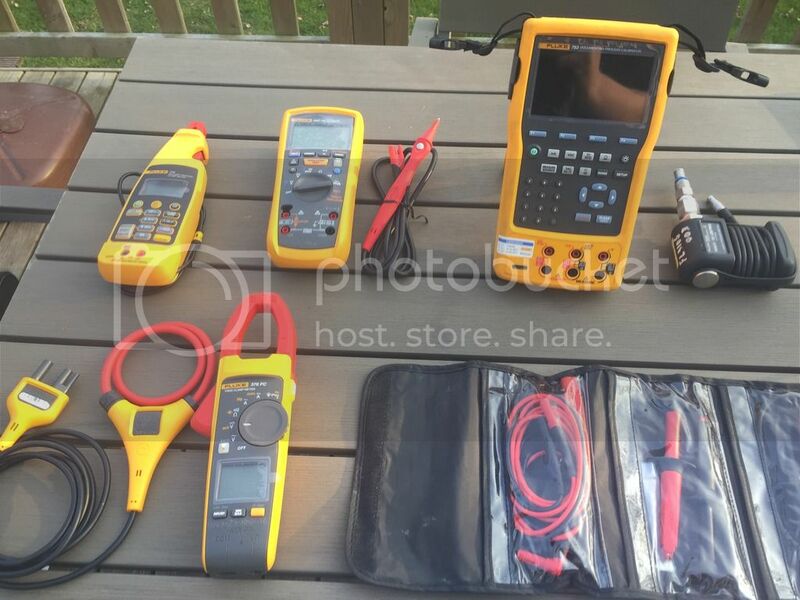 Any difference between the Fluke 26 III and 79 III? If not, why two different references? I don't know. I never found an answer to that myself. 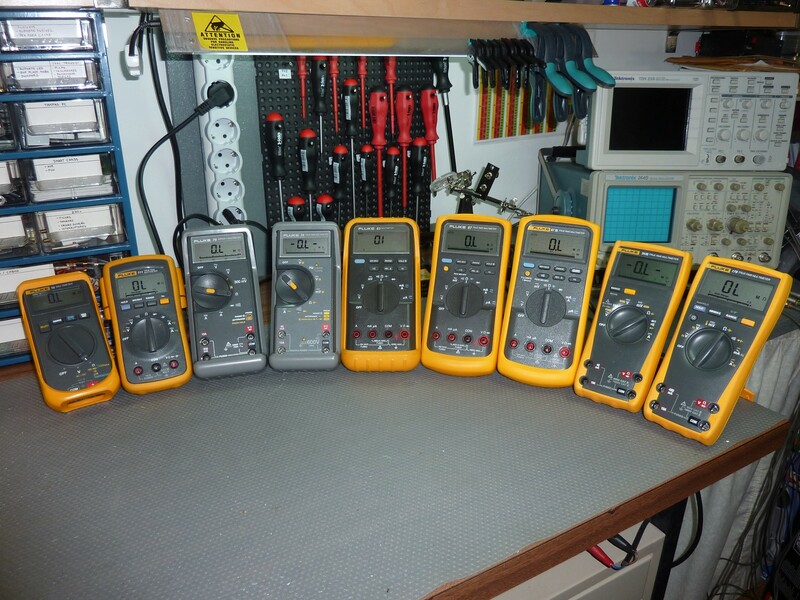 For the original and series-II meters, the 2x models were safety yellow, and the 7x models were gray. Starting with the series III "tapered" design, they were all the same yellow/gray color scheme. (The famous Fluke "trade dress".) I think the only difference was that the 2x models were sold with modular silicone leads instead of the basic TL75 leads. Maybe a carrying case or other accessories was involved, not sure since I wasn't really paying attention back when these models were new. 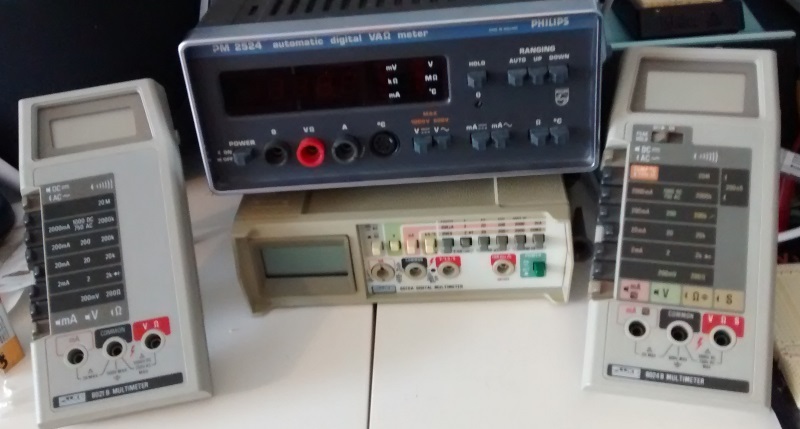 Here are some pictures of my very first digital multimeter from the early 1980s. 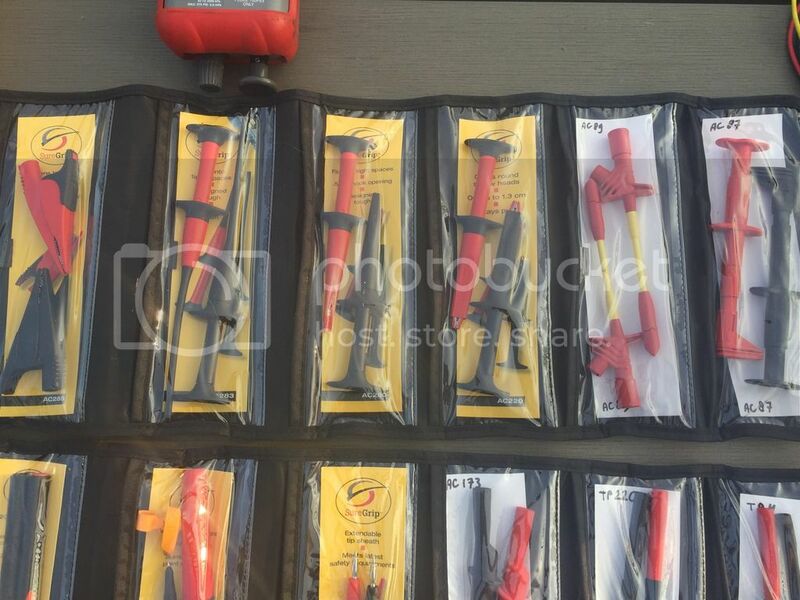 The name is: "Supertester 680D"
It came with the 2 mm Hirschmann posts. The test cables I replaced at a later time with new flexible cables and MC 2mm connectors. This was an amazingly small and powerful meter at the time. And it came in this nice case with lid. Today this old digital "Supertester" got a new battery and I hooked it up to my 10V reference. Interestingly only one least significant digit in drift after 30+ years. Most of them are from myself, and some are from the company i work for. 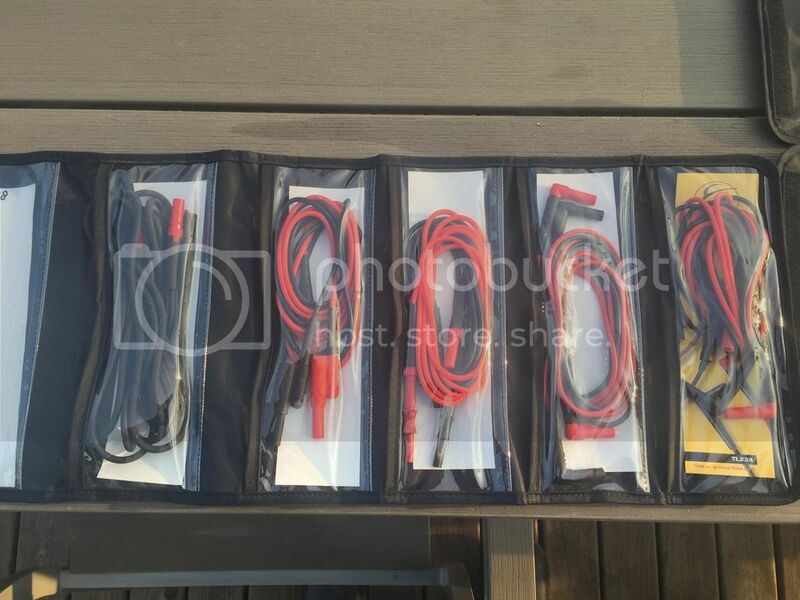 A wide range of test cables and test probes. 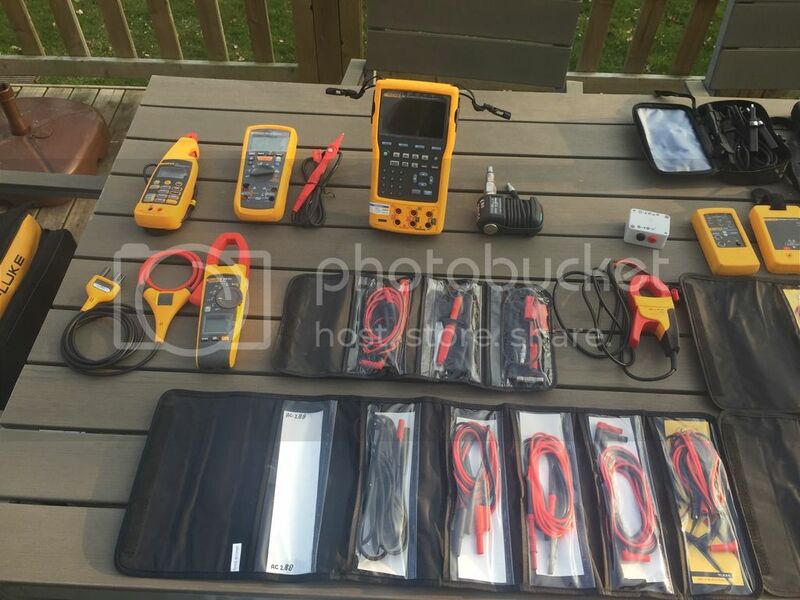 personal fluke collection: 8020b, PRV240, 9062, 707Ex, 718Ex 300G, 87-V Ex, 189, lem memobox 602 & 603.
company issued fluke equipment: 2042, Ti10, 376FC, 772, 1587FC, 753. 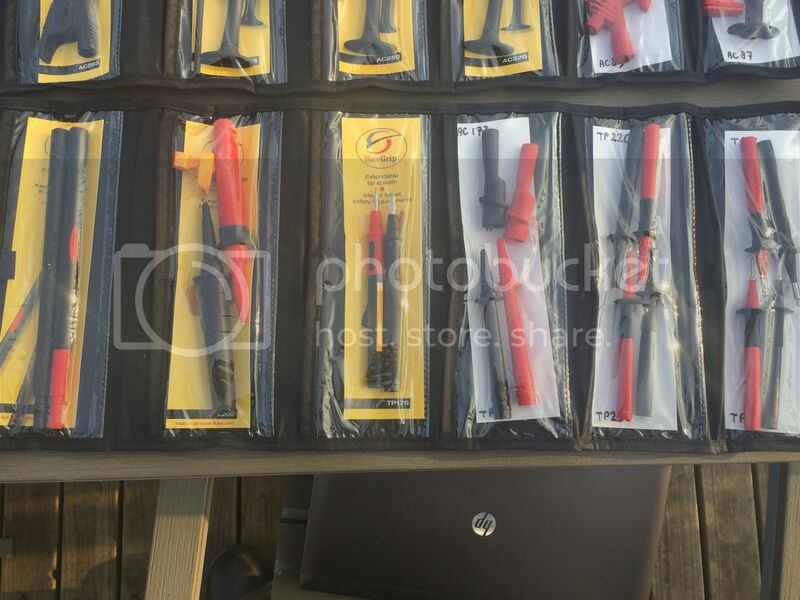 I admire your organization and care with your tools. Everything looks like brand new. My little collection of 1980s goodness. There's a missing DT830 that I'm too embarrassed to show as well. I recently sold my newer meters (!) because I like these so much. I had a Fluke 77 and a Uni-T UT61E as well. Also had a couple of Uni-T 33A's, a couple of Micronta ones as well over the years. BTW I do have quite a variety of the 8000 series so I do understand, how ever when I am being escorted to the crematorium my 77 will be firmly gripped in my cold fingers. My 77 had been pretty much destroyed to be honest. It only worked on DC ranges and no attempts to repair it were successful. It had a very hard life before I got it. I only have made-in-China equipment. 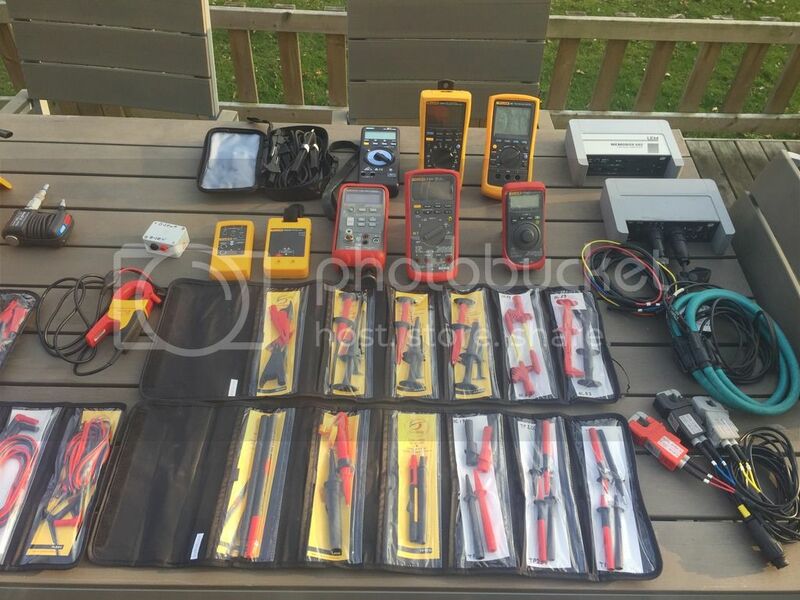 * And I have a full multimeter kit in my parts bin, I just need to come up with a PCB to turn it into a USB-capable multimeter with 24-bit ADC. I've been after one of those Philips handheld units for a while. Never seem to turn up in the UK. This series does turn up on ebay Germany from time to time. Sometimes in really good conditions for a good price too. We used them in the University and it was like the ultimate handheld multimeter of its time.